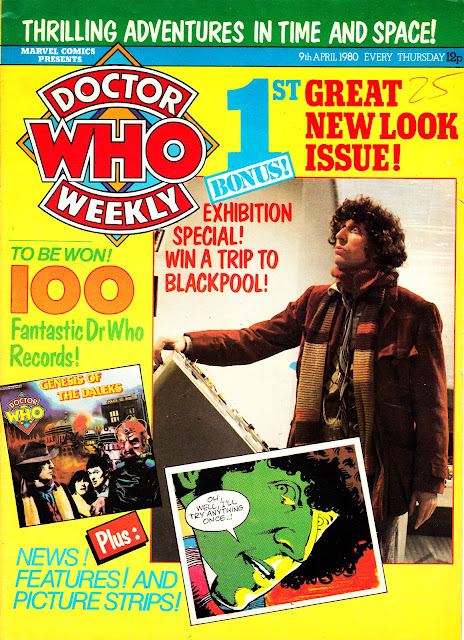 From April 1980: Only 26 weeks after its launch, Marvel UK rebooted DOCTOR WHO WEEKLY. A lot had happened in the intervening six months, not least the departure from the Annex of Ideas of DWW instigator Dez Skinn. Without its principal cheerleader, others in Jadwin House were more luke warm to the title, not least because it devoured far more cash than its all-reprint (and owned outright) companions. The costs remained constant even as sales began to sink. A situation exacerbated by the long gap between seasons and the inevitable decline in interest from buyers. Marvel's new mandarins tried to reverse the slump by rebooting the weekly and pitching it at a younger, less demanding, readership. The strips carried on as before but the editorial pages (also, conveniently, far cheaper to produce) suddenly pitched younger. Readers were even encouraged to fight the ever constant peril of the alien invasion of the Home Counties by signing up for U.N.I.T. Unfortunately Marvel, not blessed with acres of market research, was taking the weekly in the wrong direction... And not even the prospect of a trip to Blackpool could keep the unusually high number of older readers happy.